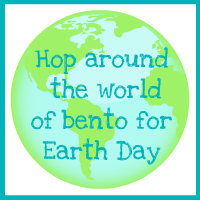 Biting The Hand That Feeds You: Earth Day Bento Hop! Leave No Scrap Uneaten! Earth Day Bento Hop! Leave No Scrap Uneaten! To celebrate Earth Day (which will be this Sunday, 4/22/12,) my Bento Blogger Friends decided to do another fun Blog Hop. We're doing this one early, to hopefully give you all some time to incorporate any new inspirations! You'll see some great food ideas for reducing waste, recycling, re-using, choosing a healthier and more natural diet, conservation, and just celebrating the Earth. As well as some other fun themes and ideas! Both of our lunches are dye-free, nut-free, and (mostly*) all-natural, preservative-free, or organic. And 98% waste-free (I threw out the carrot tops.) My lunch is even vegetarian! *the Special K crackers in my lunch are the one exception. I just stocked up so didn't want to go buy a special box of organic crackers and have so many crackers that some would go bad before we ate them. Hardly honors my waste-free goal with this lunch! Organic braising mix lettuces, yellow (green) and purple carrots, raspberries and blueberries. All-natural tortilla, ham (and scraps) and cheese. Terra Exotic Vegetable Chips. Her lunch not only has our family, made with a face cutter set from allthingsforsale.com, but also all the colors of the rainbow! Red raspberries and beet chips, orange carrots and cheese, yellow carrots, green lettuce, blue blueberries, and purple kale and carrots! I made our family from ham, assorted cheeses, and fruit leather. Spinach added under facial features to help them show up. All the spinach, carrot, fruit leather, and cheese scraps from her lunch went into my lunch. So in a way, my lunch is also recycled/re-used! apples and all-natural TJs Cookie Butter. All-natural raspberry vinaigrette dressing. To help keep our lunches waste-free, I'll be trotting out our new cloth napkins from Red Poppy Designs on Etsy! 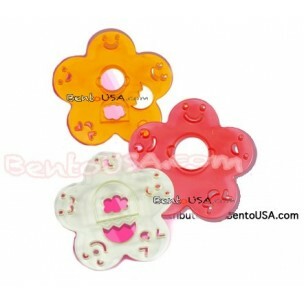 I got Z some Hello Kitty ones... and they arrived lightning fast! So then I went back and ordered Strawberry Shortcake and bunnies as well! Squee! And of course I packed in our EasyLunchboxes, which are also washable and reusable! So hop on to see what Crystal from Crystal's Ramblings created, then keep on hopping! I like doing bento-style meals, since so much of the stuff is reusable. I only throw out the paper cupcake liners and wooden and paper picks. But since they are compostable, we can put them with our other food garbage in with our yard waste, and I don't feel so wasteful. I avoid the foil-lined cupcake wrappers, since they aren't. And by teaching her to bring everything back, she not only doesn't throw out my silicone cups and plastic picks, she brings back uneaten food. So I can trot it back out as a snack, or roll it into the next day's lunch. Or, if it's too gross, toss it in with the compostables. Great lunch Mama! I did the same - cheese and carrot scraps are going on my salad today. :) yours look yum! LOVE the faces of your family - so so cute! Let us know what Z thanks of them!! Great post! The cheese family is precious! I usually eat the scraps from my son's lunch while I am making it. Some mornings the scraps are my breakfast. Your family came out amazing! I love all the little faces! Great lunch and great post! Amazing bento! I love the blueberries in the raspberries and absolutely adore the family faces! Love the facial expressions! So cute. And your lunch is YUM. I like it the way you throw every scrap in yours, and they still looked adorable. I throw mine straight to my mouth, or their breakfast plates. Great post! And thanks for the link! Those faces are so sweet, and teeny, well done! The little family faces are so cute! Oh, and also thank you for linking to the Rainbow Connection! So cute! We're so glad you linked up this week at Allergy-Free Wednesdays! As always, we hope to see you back again next week. Wow! So many amazing Earth Day submissions this week. Voting is going to be hard! The scraps from my kids lunches often end up in my lunch too! I love the blueberries inside the raspberries... I never thought of doing that! Thanks so muh for linking up to Food Adventure Friday!